KERATIN CURE & ARGAN OIL HAIR CARE - GOLD & HONEY BIO-BRAZILIAN SHAMPOO & CONDITIONER 160 ML / - DEEP MASQUE 250 G- all sulfate free - Luxury Beauty Care Products ! Keratin Cure's Bio-Brazilian Gold & Honey Post Treatment Daily use Shampoo, Conditioner are specially formulated to conserve brightness, strengthen and protect the hair and has a balanced pH that is compatible with the natural pH of your hair! -Argania Spinosa Oil Extract from the healing trees of Morocco in which help to rejuvenate dry and brittle hair and defend against flakes or dandruff while adding body to your hair. -Jojoba extract: Chinensis Seed Oil nourishes, moisturizes the hair and scalp treatment as well as hair restorative. -Olive Oil Extract: Olea Europaea Fruit Oil moisturizes and relieves the damaging effects of the sun's harmful rays and helps to regain its balance naturally. Preserve ultimate shine, cleanse and protect hair. Apply a small portion to wet hair and massage into lather. 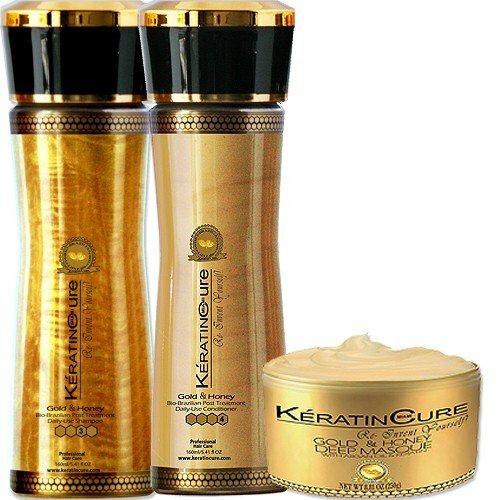 Rinse thoroughly, follow with Keratin Cure's Bio-Brazilian Gold & Honey Post Treatment Daily use Conditioner and for even better results use Keratin Cure Deep Masque for an intense hydrating conditioning. Warnings: Keep in room temperature and out of the reach of children. In case of unwanted reaction, please stop using product immediately. Argania Extract : from the healing trees of Morocco in whichhelp to rejuventate dry and brittle hair and defend against flakes or dandruff while adding body to your hair. This entry was posted in Hair Care on March 29, 2017 by admin.